3 Habits That KILL Your Success (And You Don’t Even Know it). 3 Habits That KILL Your Success (And You Don’t Even Know it). Listen, there are habits that kill your dreams. If you are asking how to be successful, these are habits to eliminate. 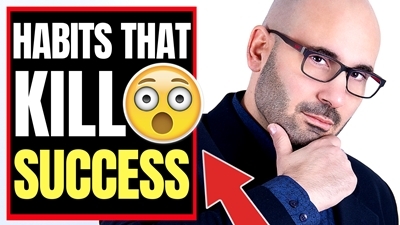 Watch this video and see if you have any of these habits that kill your success. I do not care how many motivational videos for success you watch, or inspirational videos on how to be successful you see. If you are doing ANY of these bad habits you will not succeed. 🔴 WHO IS THIS PAUL GUY ANYWAY ? I’m an entrepreneur, sales expert and author as well as a cancer survivor. My channel focuses on how to help you succeed in life and business and how to sell more and become a master closer. Some of these links here may go to one of my websites and some may sometimes be affiliate links where I’ll earn a small commission if you make a purchase at no additional cost to you. Kudos if you read everything down to here and you are reading this sentence. Your Rock!